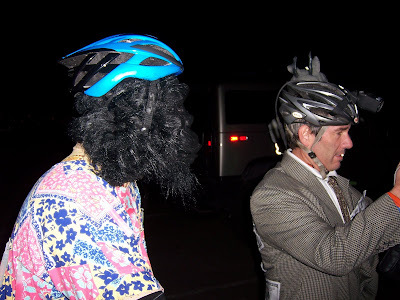 About 25-30 of us showed up this year for the Helloween ride. The temps were actually really nice. Most of us were sweating on the climbs. The trails were in perfect shape. No mud or slop. Once again, I didn't get much on film. 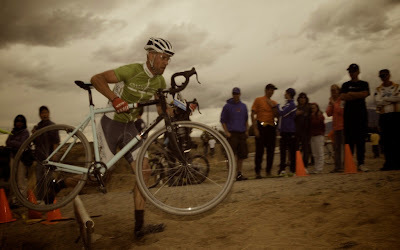 I was having too much fun contesting the hill climb and riding. But I was able to get a little bit on film. Aaron Smith had a MP3 player with speakers strapped to his top tube and was pumping out some 80's heavy metal the entire ride. One of the Iron Maiden songs was stuck in my head all night. I had to use it as the soundtrack. Post ride breakfast was at Denny's. Must have been 20 of us. Breakfast always hits the spot at 1am. Next time you see Rob, ask him what the cops said when they saw the doll in his car. Or maybe the better question would be "where did he get such a doll in the first place?" Disturbing. 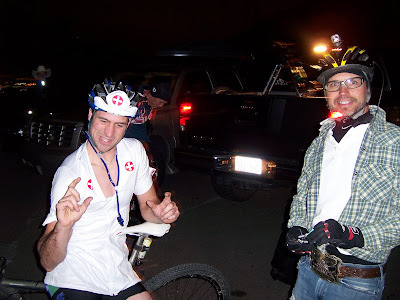 Dan was on standby in case anyone got hurt and Kenny was rocking one of his countless sub 9 buckles. It snowed again in Draper (still snowing) so we are moving the Hell-O-Ween Night Ride to Orem where the trails are bone dry. We will be meeting at the shooting range above the Orem Cemetery ready to ride at 10pm. If you take 1600 North in Orem all the way to the base of the mountain. The road will start to curve south and turn into 800 East. Just before the Orem Cemetery, there is a steep paved road on the left with a sign that says Bonneville Shoreline Trail (I'll have a Hell-O-Ween sign there too). Take that road up to the shooting range parking lot at the base of the "water tank road". 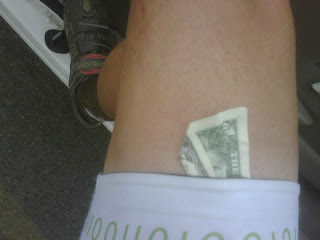 The first one to the top of the jeep road climb (where it tops out above the race course) get's the money. We will then regroup and hit the single track section (probably do Kenny's trail to Frank up to the altar and then head over to Dry). Bring your costume and come ride. See you there. I'm sure you've noticed that the trails in Draper are covered in snow as of this morning. And there is potential for more snow tonight. The Hell-O-Ween ride in Draper is at risk. My thoughts are to move it further south to Orem (Frank, Crank, Dry area). The trails in Orem are dry and very fun. At what point is it too cold to night ride? I'm still in but don't want to be the only one. Leave a comment with your thoughts and by tomorrow we will have a final decision on where to have it. I lined up with the singlespeed group still unsure of how this CX racing works. It's intimidating not having much experience. This race had a section of paved climbing that the first race didn't have. I knew this would be the spot I could try to make up some time. The legs felt good. I didn't go out too hard and blow up. I have no idea how many laps we did. It's still a blur but I was able to take advantage of a last lap burst to pull out a 3rd place finish. (If Brad didn't have his mechanical, I would have dropped a spot). I ran a 39x16 which seemed to be a good choice for the paved climb but it was a little too steep in the single track sections. It felt great to race so close to home. I heard some friendly cheers from the crowds and both Brad and Seth saved my bacon with a hand up of some water mid race. I was really thirsty from the effort and it didn't help that I had decided to take my water bottle cage off just before the race. Turns out, 50 min at race pace makes your mouth really dry. I'm officially addicted to the CX races. Something about it. I can't put my finger on it. Maybe it's the new sensation of riding skinny tires on dirt. Or the challenge of the barriers and run ups. Maybe it's the casual setting that makes me want to hang out, watch the other racers and chat. I'm not sure but I really like it. I hung around to watch the first few laps of the Men's A flight. Here is a quick 2 min video. We are one week away from the Hell-O-Ween ride. Are your costumes ready? If any of you have cool stuff to donate for prizes, please jump in. Otherwise, start saving your money and come with the $1 entry fee. Someone is going to come away with some cash. I found this logo here. 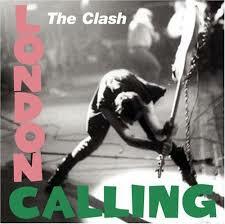 Reminds me of the Clash - London Calling Album. Very cool. 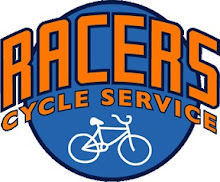 Saturday is the Draper CX race. Ironically, I'll be in Brigham City during the morning and will need to speed back down to Draper to make it in time for the 1pm call up. I'll be the guy already at top speed rolling up to the start line. If I time it right, I'll be able to keep my speed just as the gun goes off and get the hole shot. I can't wait to suffer and be humbled. Here's the thing.....Whatever bike you bring to the ride, is your choice. You can't make excuses. If you are the only SS in a group of geared bikes, so be it. It was your choice to ride without gears. Nobody wants to hear about how hard it is. Yet sometimes it's hard not to follow this rule. Take this morning for example. I was already in the car half way to work when I got the text from the co-workers about a lunch MTB ride. Because it's cross season and because there is a cross race in my backyard on Sat (Draper), I decided to throw in the cross bike as I left the house. This, of course, meant I didn't have the right bike for the proposed ride. I replied to the text confirming that I had "a" bike and would met up with them at lunch for the ride. 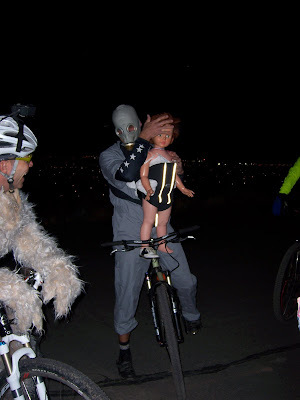 I showed up with my skinny tires, 36x16 gearing, and fully rigid bike and did my best to hang with the group. I won't lie. I had to hike a bike in a few spots but managed to keep the group in sight. The rides in Orem are steep. Designed for gears not so much for SS. And especially not for SS cross bikes. I'm not sure what was harder. The climbs or the descents. At the end of ride, I had a much greater appreciation for my disc brakes on my MTB. I don't think anyone in the group noticed my bike looked a little different than theirs. Or at least, they pretended not to acknowledge it. At some point in time, I'll invest in the tools needed to swap out my cog. But until then, I'll keep relying on friends. Which means, I tend to run whatever gear I have for all my rides. Every 6-12 months, I'll make a change but I've noticed a disturbing trend. At this rate, by March of 2010, I'll be running a 16t. I've heard the 16t cog comes with a discount on titanium knee joint replacement. I didn't get any of the race on video except the start. I guess I was too occupied with riding my bike and tinkering between laps. Maybe I'm still on an endorphin high or maybe its the lack of sleep but the 24 Hours of Moab was one of the best races I've done. I loved it. Kenny offered his "Daisy Dukes" to anyone on the team who posted the fast time. It was no surprise that Kenny kept his Dukes and maintained the alpha male status. It's also worth mentioning that Kenny decided to wear his daisy dukes for the run/1st lap. The rest of us placed bets on weather or not the shorts would make it around the 15 mile lap without falling apart. 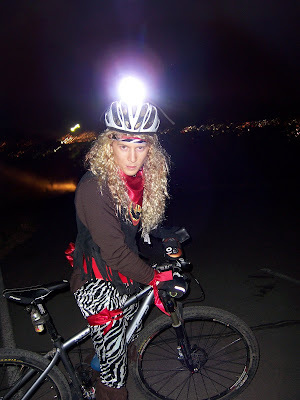 Elden was able to work his blogging celebrity status and outfit the team with Princeton Tec Switchback 3 lights. The lights worked great. I ran mine on my bar and after 3 night laps, with a rigid fork, over some very technical rocky sections, I never had to adjust the light or charge it. I give it an A. I'd buy one as my next light. Nick stepped up and filled a last minute vacancy on the team. He got the call Thur night and scrambled to get his gear ready and join us. There were some unknowns about how Nick would do. He has never owned or ridden a rigid fork and has been riding a SS for less than a year . He crushed it and posted some very fast laps and kept us on track for a strong finish. I hope Team Fatty decides to be there again in 2010. 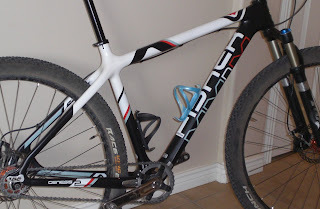 Last week, I got a call from Fatty telling me my new Superfly SS frame had arrived. It turns out, Elden has some pull with guys over at Gary Fisher. Maybe those pics of Elden and Gary hanging out were real afterall. Not only did he put in a good word but he managed to get me a frameset. And get it a full 3 months sooner than I thought. With the frameset at Racer's shop, I had just enough time to swap over the parts from my Niner to the Superfly and still have a few days to ride it before the 24 hours of Moab race this weekend. Taking a new bike down to a 24 hour race probably isn't the smartest thing to do. Not to mention I'll be running a borrowed rigid fork (Thanks Racer). I haven't run a rigid fork in more than three years. But leaving a frame like this at home just seems wrong. So I'm doing it. I'm going to break it in in Moab. I finally got it dirty today during a lunch ride so I can now post a pic. Thanks to Fatty for pulling some strings with the guys at Gary Fisher. I owe you one. But I'm still going to try and post a faster lap than you this weekend. Count on it. 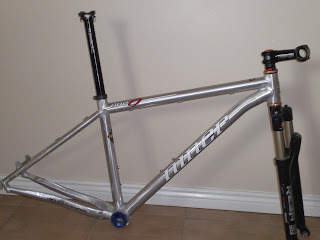 2008 Niner One 9 frame (size large) with Rock Shox Reba Race fork (only used for half of a season). Also included is a brand new, still in the box, Niner Bio-Centric BB (blue). Thomson seat post and Thomson stem included. I could be talked into adding the Chris King headset (orange). It's on KSL for $900 but I'd let it go for slightly less. I know what you're going to ask......Did I grab the dollar bill? Getting paid to ride. I've finally arrived. "Hi you've reached Rick and Rachelle Sunderlage......please leave a message"
Jamie "Hey Rick, just calling to talk about your new bike......."
(Jamie calls my cell) "Dude, I think I may have messed up. I left a vm on your home phone about your new bike. Does Rachelle know about it?" If you are a cyclist who has tried to upgrade your bike(s) and had to get creative about it, you might relate to this scenario. I've tried to do a good job of planting the seed with Rachelle before I make a purchase. Although I don't have a perfect record. There was the time I somehow ended up as the high bidder on ebay for a frame. Or the time I used my RC Willey account to buy my first nice mountain bike (back when we were fresh out of college). For those of you not from Utah, RC Willey is a large furniture store that offers a generous line of credit. How a bike shop would accept an RC Willey card, I have no idea. I didn't ask questions. And I'm sure you would have done the same. I know people who have purchased very expensive bikes without getting the proper approvals from their wife and were terrified to let them know about. In some cases, the hiding game went on for several weeks before it was finally discovered. I'm fortunate that Rachelle has always been super cool about supporting my biking addiction. I guess there are worse things I could be involved in (like golf- the worst sport ever invented). And in exchange, I try not to make a stink about the hundreds of pillows and baskets we've managed to accumulate over the course of our marriage. I can deal with the pillows if she can deal with the bikes. For me, bikes are like investments. You buy one, ride it for a year or two, sell it, take whatever you can get and apply that to a slightly nicer set up. After several years, you can end up with your dream bike and not need to pay out the nose for it. My dream bike (at the least the frame) has finally arrived. Hopefully I'll have a week to dial it in before the big race next weekend.